A. L. Baert, Diagnostic nuclear medicine: Springer Science & Business Media, 2013. M. P. Sandler, Diagnostic nuclear medicine. Lippincott Williams & Wilkins, 2003. Objective: The study aims to assess the value of nuclear medicine and ultrasonography for diagnosing renal diseases among patients of different ages. Method: Quantitative analysis has been opted for evaluating the effectiveness of both imaging modalities for the diagnosis of renal diseases. 80 patients were targeted, who were having renal disease indications and they were diagnosed through modalities. The outcomes of both imaging techniques were compared through data analysis. Results: Positive findings of the nuclear medicine were observed between the age groups 0-12 years (58.1%), 13-24 years (16.1%), 25-36 years (1.6%), 37-48 years (9.7%), 61-72 years (3.1%) and 73-84 (8.1%) years of patients. Concerning the ultrasonography technique, positive effects were observed among the patients of age-group 0-12 years (58.7%), 13-24 years (17.5%), 25-36 years (3.2%), 49-60 years (3.2%) and 73-84 years (3.2%). The sensitivity rate for nuclear medicine was 100% as compared to ultrasonography, which was 93.6%. However, the specificity and accuracy rates for nuclear medicine were 78.4%, and 21.5%; however, similar rates for ultrasonography were 79.7%, and 13.92%, which showed better outcomes of ultrasonography. Conclusion: Ultrasonography was observed showing positive results among all age groups as compared to nuclear medicine imaging modalities. Future studies must focus on other imaging techniques to timely diagnose the disease and initiate the treatment before it get worse. The study contributes to assess the efficiency difference between the nuclear medicine and ultrasonography to effectively analyze the case of the renal patients, before it gets severe. The study further documents the value of nuclear medicine in comparison with ultrasonography for the early diagnosis of renal mortal and morbid complications. J. A. Balogun, "The path to our destiny: The transitioning of physiotherapy from a semi-profession to a true-profession," presented at the A Key Note Speech Delivered at the Third Christopher Agboola Ajao’s Lecture on the Occasion of the 55th Annual Conference of the Nigeria Society of Physiotherapy held at Lokoja, Kogi State, Nigeria, 2015. J. A. Balogun, "Brief on the proposed national postgraduate physiotherapy college of Nigeria." Retrieved from https://www.researchgate.net/publication/310473802_BRIEF_ON_THE_PROPOSED_NATIONAL_POSTGRADUATE_PHYSIOTHERAPY_COLLEGE_OF_NIGERIA_NPPCN, n.d.
 American Physical Therapy Association (APTA), Professionalism in physical therapy: Core values. Alexandria, VA: American Physical Therapy Association, 2003. O. William, "William Osler papers father of modern medicine: The Johns Hopkins school of medicine, 1889-1905. Retrieved from https://profiles.nlm.nih.gov/ps/retrieve/Narrative/GF/p-nid/363/p-docs/true. [Accessed January 31, 2017]," 1903. R. L. Cruess and S. R. Cruess, "Teaching professionalism: why, what and how." Retrieved from https://www.ncbi.nlm.nih.gov/pmc/articles/PMC3987476/ . [Accessed November 23, 2016], 2016. Registered Nurses Association of Ontario (RNAO), "Professionalism in nursing: Healthy work environments best practice guidelines." 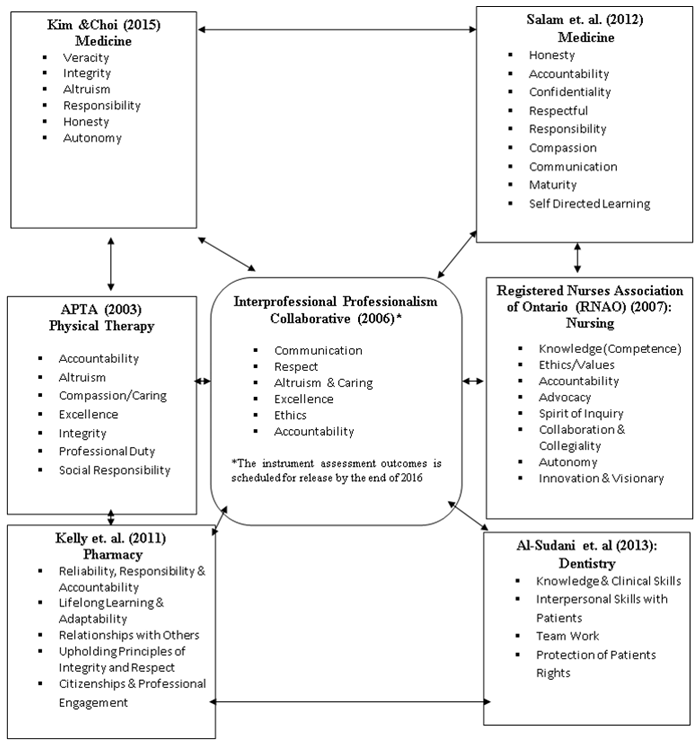 Retrieved from http://rnao.ca/sites/rnao-ca/files/Professionalism_in_Nursing.pdf . [Accessed January 20, 2017], 2007. C. Miles-Tapping, G. Rennie, M. Duffy, L. Rooke, and S. Holstein, "Canadian physiotherapists’ professional identity: An exploratory survey," Physiotherapy Canada, vol. 44, pp. 31-35, 1993. Readable, "Measures text readability. Retrieved from https://readability-score.com/. [Accessed November 23, 2016]," 2016. L. G. Portney and M. P. Watkins, Foundations of clinical research: Applications to practice. Appleton: Lange, 1993. Minitab 17 Support, "Using kappa statistics and Kendall's coefficients." Retrieved from http://support.minitab.com/en-us/minitab/17/topic-library/basic-statistics-and-graphs/tables/other-statistics-and-tests/using-kappa-statistics-and-kendall-s-coefficients/, 2016. Federal Ministry of Health Nigeria, "List of all federal teaching hospitals." Retrieved from http://www.health.gov.ng/index.php/parastatals/teaching-hospitals . [Accessed November 23, 2016], 2016. E. Lambo, Chairman’s opening remark at the celebration of the 50th years of physiotherapy training in Ibadan. Nigeria: University of Ibadan, 2016. Background and Purpose: There is currently no culturally appropriate instrument to assess Nigerian physiotherapists’ knowledge and attributes of professionalism. This study sets out to develop a psychometric instrument to assess the knowledge and attributes of professionalism of Nigerian physiotherapists, and to investigate the instrument's readability, stability, and internal consistency. Methods: A Professionalism Inventory with eight demographic questions, ten knowledge of professionalism questions and sixteen attributes of professionalism perception-based statements was developed. The attributes of professionalism scale assess clinical competence, a spirit of inquiry, accountability, autonomy, advocacy, innovation and visionary, collegiality and collaboration, and ethics and values. The Inventory was completed on two occasions, after two-week interval, by 91 Nigerian physiotherapists. Results: The Inventory’s average grade reading level was 10. The intra class correlation coefficient (ICC 3, 1) for the knowledge of professionalism scale ranged from “moderate” (0.421, p<0.001) to “substantial” (0.770, p<0.001). The Kendall's coefficient of concordance for the attributes of professionalism scale ranged from “fair” (0.368, p<0.001) to “moderate” (0.547, p<0.001). The Cronbach alpha for the knowledge of professionalism scale was “almost perfect” (0.813, p<0.0001); and “substantial” (0.780, p<0.001) for professionalism attributes scale. Conclusion: The knowledge and attributes of professionalism scales are stable and internally consistent. The availability of this psychometric instrument will promote studies of professionalism in physiotherapy. This study is the first psychometric instrument developed to assess Nigerian physiotherapists’ knowledge and attributes of professionalism and also the first to document the instrument's readability, stability, and internal consistency statistical properties.